We all want to get found online, great then what? Convert your blog visitors that are coming over from social media. Let’s talk about that as a result you can and must think about having from your blog and social media. Email marketing can be profitable for anybody, no matter what kind of product or service you offer. But building your list, which is the foundation of email marketing success is in the quality and size of that list. If you build a list of subscribers that trust you and consider you an expert in your field, your response rates will constantly climb. The first thing people ask, when they hear about a list building system, is what is it and how does it work? Join thousands of others that have learn pieces of the puzzle on our “How To Build Your Email List’ no-cost Tele-class. Helping people through information, resources, insights, and useful tools. Earning trust in your online community. Turn your followers into blog visitors. And turn your blog visitors into sales opportunities. Reaching out and making meaningful connections with others online who share your interests and passions is inspiring, interesting, thought provoking and well you ‘get’ it.It’s well worth your time and efforts. This is not a mindless diversion. It’s what you do for your blog – to share your passion and information. You make it an extremely productive activity. Maybe all your work could continue into something more – You could be generating an email list so you can grow your income by using your blog and social media as your marketing funnel. Interested in learning more about generating an email list and your own social media marketing funnel? Click on that picture, right there Go ahead and sign up – it doesn’t hurt, I promise! OK – You say you’re not a marketer? You promote your information through content marketing with your blog and social media. Now ask yourself and answer this: what are the results you want from your blog and social media? You have to know that you can use content marketing as a funnel to grow your community. I would venture to say that you want to bring traffic over to your blog from social media. Right? – And, then you want that traffic to turn into readers that want more of your information on a regular basis and come back more to get more valuable information from you. You’re attracting and pulling them in with your magnet, based on valuable content that appeals and supports your readers, not spam that interrupts them. You understand that your audience wants to be pulled to you. Not pushed. Great – you now have your content attracting your audience of readers! What do you want them to get out of their experience with you? You can start turning your readers into valuable raving fans and building your email list so that you can nurture those relationships with more of your invaluable content that you know they want from you that only you can give through your email list. This is part of your content marketing – you funneling your readers through your system. 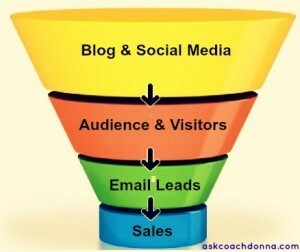 From your blog and social media, you’re generating marketing funnel leads. – Giving you the opportunity to be engaging with someone who may not have even known they had a problem that your content may be addressing. And…you’re getting them before other like type blogs or competition attract them. – Giving you the advantage to continue that visit and start them down the conversation road with your content marketing ~ This is your funnel. How do you create the content for your sales funnel? Build more social media traffic to your site. Are you willing and wanting to collect a list of emails to build a relationship with your audience that has longer lasting results for you and them? Where are you at with this process of your blog and social media as a content marketing funnel? I write and hope it helps someone somewhere along the line. I try to write about my experiences and share my life so hopefully people get something out of it. I love writing and sharing my stories with my readers. It’s cool to turn something you’re passionate about into a career and full-time income for your family, however I just do it for fun. Aly Mashrah recently posted..Do You Dare To Go Commando? This is great information. I personally really need to work on my social media. Thank you for all of these tips and things to think about. My goal is to share things that I love with my readers. Great post. It’s always great to have a plan to figure out what you actually want your readers to eventually do when coming to your blog. Tonya C recently posted..How to add an affordable new look to your home with pillows! I really want to open up more time so I can communicate more with readers. That’s at least my next step. I have found that it is essential to have a plan. There is no winging it when it comes to blogging. You need to know what you are trying to achieve and plan a way to make it happen. I’m not too sure where I am. I just do my thing and enjoy what I do, hope it helps someone or someone stumbles upon my site and wants to chat and share our experiences. I’m not too worried about all the other stuff. These are great tips! Thanks for sharing them with us! I really wish I had time to learn more and sign up for opportunities. You always have so much great information. These are wonderful tips for bloggers. I always find your site so informative. Thank you for taking the time to explain things clearer for us. I tweet and share to get the word out. Hopefully someone will find what I share useful. It takes a lot of hard work. This information is very helpful. Thank you! Your posts always get me thinking. I really need to focus on what I want from my blog and social media, not what I think success looks like to others. I agree. I’m making some changes soon that will add a more personal touch. I’m excited. There is so much information out there, and the more I read the more I am learning the vitality of blogging and email list. I blog on 2 websites (one more frequently than the other) and this summer I’m working on blogs for both of them. I hope to increase the life-expectancy of our brick and mortar stores. Excellent Idea, Tina and what a busy time for you – and I’ve just sent you a friend request on FB! Thank you, Mogana – I’ve sent you a ‘friend’ request on Fb and hope to see your name on the Email List Building Call! Once you have a plan, it’s a lot easier to set and meet goals! You always give me something to think about. I like the whole call of action thing, but the whole “register now” wording seems like you are fishing for information, I really don’t want to share. If I stumble across a blog I like, I might add them to a feed or follow on a social media network, but registering, no. I completely disagree with this idea and avoid blogs where I need to register. I think engaging readers and my community is something I need to work on more. Lots of great info here. We can always improve on our reach and engagement! Thanks for sharing these great tips!! I just hope to help others. If someone likes it and shares it I’d be happy! This is pretty interesting to read about. I could always use a better boost and now I know how! Thanks 🙂 From a newbie blogger! This is a bunch of really great information! It is also a lot of great questions that I need to ponder on! Thanks for sharing! Mistee Dawn recently posted..I got a sneak peek of Bravo’s Odd Mom Out and it is hysterical! Wonderful tips! I love to write about a lot of things and share it to my readers. Hopefully, they learn from me and me from them. I will check this out. I love it when your post can connect to many readers, it is satisfying feeling. Thanks for the tips. The more I read all of this stuff, the more I think I need a virtual assistant or an assistant in general. LOL. I just recently had the author of a book find my post that I did on his book. I would love to know how he found me. That’s exciting, Beth! Can you ask the author? So glad you commented and let us know that! I recently saw a clever way to attract readers to join an email list. The blogger/artisan was offering a few master painting class tutorial if you signed up. I thought they offered something very valuable to those with an interest in art. This is a great list of information, I’m glad when I started blogging I was building up my social media then, I still work hard on it and call it “investing” whenever I refer to my job duties for the day. I write because I enjoy it, hopefully what I write is something that someone else wants to read. It is so hard to find a happy medium between sponsored and readers. What did we all do before social media?! I feel like online blogging work has doubled- you have to write great posts AND do fulltime social media work too. It’s crazy how much my income depends on people finding me online! This is so timely. I’m preparing my irresistible opt-in materials right now! I’m so excited to finish and would be working on them today but I have to go do a few IRL activities! Ugh!! This is so true. It is so important to build up your lists as early as you can. I will have to try using a few of these tips. That is good advice. Real handy to implement. These are great tips. A lot of bloggers don’t see social media as turning into sales, but it is essentially the same thing but getting people over to your blog and having engagement which can create more traffic. Thanks! Great tips as always. I really need to sit down and figure out my goals as a blogger!! I think you have the first step covered – find out what you want (set your goal) and strive to achieve it. No one said it was easy though! Scott recently posted..The Red Carpet Awaits! I think you have hit the nail on the head. Building a foundation for your blog by knowing who your potential audience is and what they want are so important, especially if you are looking to do business through your blog. I can tell you, that did not make me want to engage and spend my time with that person, even through email! If you are looking to engage an audience, there has to be true engagement. Especially since there are so many options available now. These are all “great” things to think about for building an audience and attracting clients that will be interested in what you have to offer. It really is all about building authentic relationships and gaining a sense of trust with your clients. My main goal is also to build my audience for my blog. I want to write nonfiction and freelance as well. Thanks for your tips. I don’t know what my opt in freebie should be. I thought about a photo with inspirational quotes. Any feedback appreciated. I need to refine the strategies you’ve outlined. Mainly determining my desired outcomes. I’m working on driving social media traffic to my site this month. I’ve found the most success on Pinterest and as a result, have learned a lot about my customers/audience. Great tips and reminders to keep building my blog! I did everything so backwards when I started blogging five years ago, and I would have loved to have built a foundation and audience ages ago. Tamara recently posted..Feeling Proud To Be the Odd Mom Out. I write the way I talk to people an just hope someone like what I have to say. Social media and numbers are something i don’t quite get still. I write for several reasons. But mostly, I write for me. I write to work through things, to put it out there and sort through my thoughts. Thank you so much for this post. This is a great learning tool for a lot of new bloggers out there (me). I have been trying to tackle some of these issues on my own & this has really helped me. I wish I knew as much as I do now about blogging when I started 6 years ago. You always provide so much thought-provoking material. Bookmarking this to focus on later! I love to write about my travels and different items I come across. Lots of fun. I like when I am able to connect with people all around the world. I think that’s why I love blogging so much. Thanks for the great tips! I’m working on improving my blog at the moment. I’ve played with Opt-ins and didn’t really see an increase in subscribers. I need to find something I can offer that people really want! This is interesting. I am hoping to help other parents. ourfamilyworld recently posted..Help! My Teething Infant Stopped Feeding Himself! This is great info for us! I try to write about things that interest not only myself but others so that I can keep bringing them back for more. I’m just now learning how to do this. Thanks for all your info! Cheryl Nicholl recently posted..Dear Darling Husband. The World Must Balance.